If you came over to my house, you’d be welcomed with an abundance of all things country–cows, chickens, barn wood…but as much as I love my country chic style, I wanted something different for my patio. When I go outside, I want it to be a break from the usual. I want it to feel like a magical escape from real life. I wanted it to be whimsical. Behold, the Incredible Whimsical Patio Makeover! We’ve partnered with Jasco for this incredible whimsical patio makeover and my outdoor patio decorating tips. This post contains affiliate links; by purchasing through these links, you help support the Arts & Crackers family! I may have gone, uh, a little overboard on mine…but I will share my outdoor patio decorating tips with you so you can do your own whimsical patio makeover on any size patio or garden space. There are so many ways to create a whimsical paradise on any budget. When I think of all things whimsical, I picture flowers everywhere, tiny things like fairy gardens, things that make you feel tiny, an explosion of color, quirky upcycled items, stained glass, and twinkling lights. Since we have a large deck, I wanted to encompass all of these qualities. The house we currently live in is a rental, so we can’t really do things that are permanent. The deck was here already, as was the table. Funny story–when we moved into this house, the deck was here and the picnic table was here and the broken planters on the deck railing were here. For months and months we thought they were attached to the deck and were completely unmovable…until the owner came out to do some repairs and was surprised we still had them there. What?! Apparently we could have moved the table and tossed the planters a long time ago. Obviously, those were some of the first things we took care of. Shift around your furniture (even add some more)! One of the first things you can do when updating any outdoor space is to move or add furniture. If you already have some wonderful furniture, great! Work with it. Move it to the happiest, sunniest, most magical spot you can find. We already had a picnic table as part of the deck. I couldn’t take it down, but I could move it around to create a space that flows better. Still, I felt like I needed something more. I found a floral bistro set for a good price and added a little “tea corner” as I call it. This is where I like to go on nice mornings and read my Bible, write in my journal, or just soak in the beautiful nature of morning. Think about what you want to accomplish with your space. We like to entertain, but we also like to have one-on-one time, family time, and time alone. The picnic table is perfect for seating guests. The bistro table is the perfect place for just me or for some husband and wife time. We added a chiminea for family time roasting marshmallows around the fire. We chose a chiminea over another type of fireplace because it is more compact and I think it totally looks more whimsical. Since we are using it on a deck and we needed to consider fire safety, we placed the chiminea on a large concrete slab to keep it off of the wood, made sure it was only opened on one side, and was at least a couple feet away from the patio railing on all sides. We also did not put any furniture directly by it, but instead will pull up chairs around it like a campfire as needed. The great thing about whimsy is you don’t need things to be perfect. You can add your own style and personal touch. In fact, things that are a bit imperfect exude even more whimsy. Since my chiminea, which was one of the focal points of our outdoor family space, was plain, I added my own personal touch of whimsy. Using acrylic enamel/multi-surface satin paint, I painted bright and whimsical designs on my chiminea. I added some flowers on a vine, squiggly stripes around the opening (but not near where the fire touches), and, my favorite part, a sun/moon design! Our patio has no lights. Literally, it does not have one single light. When nighttime falls, our deck is pitch black, which is amazing for seeing the glittery stars in the velvety night sky, but not for preventing my inevitable tripping over the grill when I forgot my notebook on the patio table. I’m used to a patio light so you can enjoy your deck at night, a motion detector, a flood light…this house does not have lights at all and we can’t install one since we are only renting. We found an amazing solution to our light problem–Enbrighten Lights! Jasco has some amazing outdoor lighting solutions, like their New Enbrighten Landscape Lights. Jasco offers these lights in various options to fit the needs of your unique outdoor space. They come in three lengths (50 feet with 6 lights, 80 feet with 9 lights, and 110 feet with 12 lights). I received two of the 50 feet light sets. The great thing about multiple strands is that you can customize even more, whether you just want more exciting light shows or you want to highlight different parts of your yard or patio. The lights are controlled by remotes and they are so simple to use. This is one thing I absolutely love about them, because now we can quickly and easily turn on patio lights to see where we are going if we need to do something outside on the patio at night, like putting the cover back on the grill once it has cooled. Another thing I really love, something that just screams “whimsy,” is that these lights have tons of different color settings. They are perfect for year-round because they are all-weather and can celebrate any occasion–Christmas, Independence Day, even combos to celebrate your favorite sports teams–with a variety of pre-set and customized color options. These Jasco Enbrighten Color Changing Landscape Lights are meant to be placed under railing or along pathways. They come with stakes to place them in the ground or they can be mounted upside down without the railing. Naturally, I did something completely different. Since our deck is raised, we couldn’t really use the stakes to place them around the patio on the ground. We could have mounted them under the railings or just set them around the patio and that would have looked fantastic. However, since we do not have any lights back there at all, I had this bright idea (pun intended) that lights up higher would light up the space more. I was right. Using some long wooden posts someone in the neighborhood was getting rid of, we added more height to the space. My husband helped me attach these posts to the deck using bungee cords and zip ties. Now, I do realize this isn’t very fancy, but it was the best way for us to attach these posts without ruining the deck that is not technically ours. My husband ran paracord between the posts to hang the lights from. We hung the lights using mini zip ties. To create a better privacy barrier and keep the light focused on our patio area only, we stapled landscape fabric to the posts behind the lights. This is not very sturdy, so make sure you have enough posts to staple to, fold the fabric over where you staple it so it doesn’t tear as easily, and make sure it is taut so the wind doesn’t grab and rip it. If you have more time and money than we did for this project, I would recommend something like lattice instead of strings for the lights. It would be sturdier and look a bit prettier. Then if you do choose to add landscape fabric or some other type of inexpensive fabric behind it, you’ll have more space to staple it to so the wind can’t catch it and tear things apart. You can choose many different settings on your Enbrighten Landscape Lights. Dim the lights, set timers so the lights don’t stay on too long, leave the lights on one of the three white light options (this is our go-to when we just need some patio lighting to complete a quick task at night), or create another color combination of your choosing. You can select up to 16 different individual colors, select two-color combinations, or use one of the preset modes with holiday themes, slow-strobe lights (I call them twinkling…very whimsical), or other fun effects. Add Jasco Enbrighten Landscape Lights to your whimsical patio space or whimsical garden. Find them at Sam’s Club or purchase them online. Learn more at enbrightenme.com. One thing that I really think of when I imagine a whimsical escape is somewhere that has items that make me feel almost like I’ve been miniaturized because there are massive things that tower over me to itty bitty items that make me feel like a giant. I love adding dimension and character to a space. A lot of the time people will already have a tree in their yard to add dimension. Our yard, however, is flat and open with no wonderful trees to incorporate, so we had to get creative. To add height, we purchased a peach tree that we are able to keep potted during the time we live here and will plant in the ground when we buy a house. We also purchased another flowering tree that we potted and set on top of the base from the broken fountain we received. Its branches overreach into other areas of the patio to add some of that overhead whimsy that our patio lacks. In one corner, we purchased a big metal trellis to hang potted plants from and give a small privacy barrier to our little “tea corner.” We spray painted it a magenta color so it would pop a little more then filled it with cascading plants. I also hung a beaded chandelier over the table to add more height and whimsy. This was a fun way to get my boys involved in helping with projects for the patio. I will share that tutorial with you at a later time, so watch for it! Since that shepherd’s hook holder is meant to be stuck into the ground, we had to use several zip ties to hold that down at the base to keep it in place and centered over the table. We also used zip ties for the trellis and our other shepherd’s hook holder and our solar powered flower to make sure everything stays in place when it is windy. We used black ties for most of them, so you can hardly tell they are there. You will likely need to do this for any areas where you wish to add height, because wind likes to pull these things down, especially if they are semi-permanent and not fully attached. We added medium height with another shepherd’s hook with a hanging plant and potted plant, our solar powered flower, the fairy garden, and a faux stained glass trellis. For lower items to add some interest, we used a glass gazing globe, the half of the fountain base that broke was used as a flower (painted using those same acrylic enamel paints), and a little turtle decoration which served to add a little fun and cover up where the cement had broken unevenly. Our lowest item, to add some texture and a softer place to stand, was the faux grass rug. These don’t have to cost a ton and can make certain areas into a focal point like an outdoor rug would do. Our tallest items were the wall of twinkling lights and the patio umbrella. These are two of my favorite things on the patio–because who doesn’t love twinkling lights and sitting under a giant toadstool?! The umbrella was a challenging one because it is free-standing. Our first base did not do well with such a large, free-standing umbrella (proof you should read packaging). We purchased a wider, heavier duty base with a taller area for inserting the umbrella post so it stays in place and doesn’t fall over. A 50-lb stand works great. When it’s windy or the umbrella is not in use, be sure to collapse it down so the wind cannot catch it so easily. Note: We tried to give the umbrella a cream white base, but our first attempt (shown) did not work out quite as planned–it’s a long piece of hollowed bamboo with the side slid to fit around the umbrella post. We are replacing it with a piece that is slit the entire way down so it is one solid piece and will tie it on so we can use the crank at any time–this should work perfectly now that we have the proper base. We will also cut slots at the top so the umbrella arms can move up and down smoothly so we don’t have to remove the bamboo every time we went to close it up. Another option would be to paint the post itself with durable paint that can handle the umbrella arms moving up and down. If you have a convenient tree, use it! Overhanging branches can be so beautiful and utilizing a tree you already have will save you money on extra trellises and things to add height. If you have a garden already, you can incorporate that as well. Add some mulch for texture. Flowers…plants in general…are simply essential for anything whimsical. We planted a wide variety of flowers and trees and fruit/vegetable plants around the patio. These add beauty and atmosphere and attract butterflies! The fruit and vegetable plants will also continue to provide food for us. Our succulents are all planted together and do not get watered as often. Many plants are by themselves, but several flowers are planted together in pots. Make sure all the plants you choose will work in the size pots you choose, will have the proper light exposure (ours gets insane direct sunlight, so we need ones that are okay with fairly dry soil and plenty of sun), drain well (especially if you have to do potted plants like we do), and have the proper soil. We went to a local garden center and got a great deal and they were incredibly helpful on what to get, how to plant them, and how to take care of them…since I have quite a black thumb when it comes to anything planted in pots outside. Since I have to plant everything in pots, I added a mixture of pea gravel and river rocks to the bottoms of the pots to help with drainage so the plants to not end up over-watered. PS, if you have any great tips/advice from experience with any of the plants we have, I’d love to hear about it! You don’t need to go totally overboard with decorations to make things look cluttered, but add little items here and there to peak interest. Use items you purchase and items you upcycle! After I found some of the stained glass paint I’d been looking for, I made a couple more small stained glass paintings with the extra glass pieces I had and hid them in a couple plants. If you have young children, do not place these where they can get to them. After my kids broke glass at a craft store, they now understand the dangers of glass and will steer clear of it, thankfully. I added wind chimes around the patio because I believe that sound is just as important as looks for true whimsy. I chose various types of chimes so we can hear a variety of sounds…like an orchestra! Music is supposed to be good for plants, too, so having the wind chimes there is extra beneficial, right? I’ve always loved those watering cans that pour crystals, so I made one of those too, in my own way. I hung mine over the pool so it sort of looks like it’s pouring into it. I love how the sunlight catches the crystals and makes them glimmer! We had extra glass stones and river rocks from the plants and fairy garden, so I added a few of those in each pot minus the tomato plants. I also added some cute planter decorations in most of the plants. I’ve always wanted to make sweet mosaic stepping stones with my boys, so we finally did it together as a school project and added them to the patio as well. S did a heart and E made a turtle. Have you gotten into the painted stones frenzy? We haven’t done a whole ton of this since we hadn’t been able to find rocks, but I wanted my boys to make some for the patio so I could have some of their work outside to enjoy. We realized there were tons of perfect rocks on the hill by our house, so we went rock hunting. We ended up finding some gems while we were up there too! For whatever reason, I couldn’t not have giant flowers for the patio, so I found these metal ones and hung them from the big garden trellis using S hooks. I had some extra open space and we already had a cute kids’ rake, so I hung that with a S hook as well to decorate the patio but also to have handy should the kids wish to use it. I love watching nature and we get so many hummingbirds coming to our feeder in the front yard, so we added a neat feeder to the patio as well. We haven’t gotten any hummingbirds yet, but hopefully we will soon! Add some throw pillows around the seating areas. These will help add a little extra comfort where you’re sitting and also look really cute. The red pillow broke up the solid white of my bistro table and tied in the color of the toadstool umbrella. The other pillows had random colors and designs to create an interesting corner by the very plain picnic table area where we did not add a whole lot of other decorations. We found this beautiful glass vase at a rummage sale, so I filled it with water and bright cut flowers as a centerpiece for my bistro table. I didn’t even realize at first that the flowers I chose to fill the vase with were basically the same as the mosaic pattern on the vase! Get upcycling/use what you have! Use something old to make a decoration of your very own. I upcycled a handful of items I had or received. I received this fountain from someone in our subdivision. It was pretty broken; it wouldn’t hold water and the pineapple was missing its leaves. When my husband picked it up, the base split into two. And a gorgeous succulent fairy garden with a fairy pond (aka a bird bath) on the top. If you know me, you know I can’t help but love cows. Even though I didn’t do my usual country theme for my patio, I still hid a cow in my whimsical patio makeover…because it still needed to have a cow somewhere, of course. And to avoid wasting the rest of it, I used the bottom as a planter holder to stack plants in one of my flower pots. This glass bulb was actually a light fixture I found on clearance. I may add more color later, but for now I mixed some different glass paints inside the glass. I’ll use the bulb that came with it in one of my indoor lamps, and I’ll let my son create some type of robot (or whatever he comes up with) using the base. Check out my little “Bee Spoon” as I call it! Turn bricks into fake books! This is totally not my idea, but I loved it and it is a great way to upcycle. The boxes I used for my extra shelving (that covers up the area under the table that would show everyone’s dangling feet) are actually empty ammo boxes that my husband received. I nailed the lids to the tops to turn it into a sort of buffet side table. For years I had this metal trellis and I just didn’t know what to do with it. I used glass panes, permanent bond glue, and hot glue to turn it into a glass pane to stain. To paint the glass, all I had at the time was the acrylic enamel, so I watered it down a bit and used that. It didn’t give me quite the stained glass look I was hoping for (I ended up finding transparent glass paint later), but it did add a touch of imperfection and whimsy. We get a lot of bugs here. Just working on the patio projects outside, I managed to acquire over twenty mosquito bites. Yikes! I turned these cute flower pots into citronella candles to keep the bugs at bay. The candles look so beautiful at night with Jasco Landscape Lights in the background! 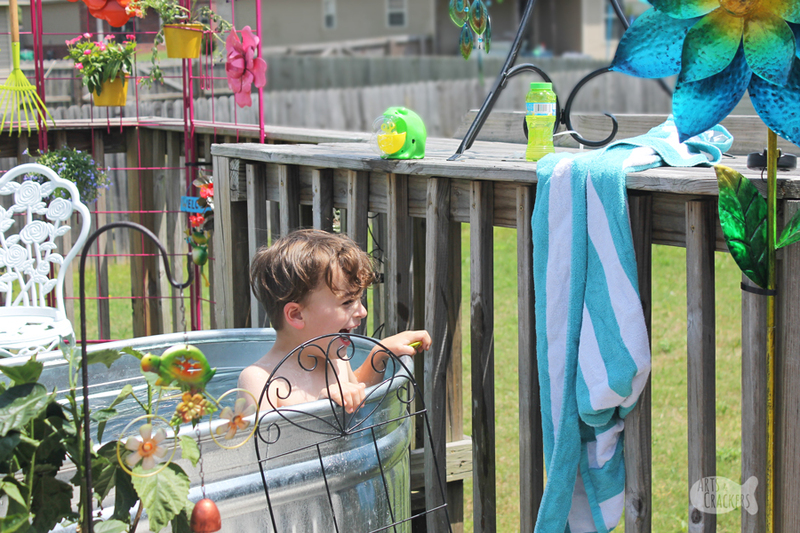 Definitely consider safety if you have young children, as water can be dangerous. We decided to add a small stock tank pool since it gets incredibly hot here…we skipped spring here in Arkansas and it was in the 90s and cloudless during the entire time I was working on my patio! Shade and water are essentials. Ultimately your pool should have some sort of pump to prevent stagnant water, but we went ahead and left it as is for now. We will be adding a pump to get the water moving, but can drain and refill in the meantime. We added a lily pad plant to give it a pond feel. We may regret this later, but for now it’s whimsical. This pool is for relaxing, cooling off, and calm play more than it is for crazy kid play, since we don’t want to overwater the nearby plants, so the plant stays in tact fine and lily pads are resilient anyways. We also added a small amount of water in the repurposed fountain as a sort of bird bath. We glued down extra glass pieces from the stepping stones then added some extra glass pebbles, sea glass, and other various items to make it a little sparklier. Enjoy your whimsical patio makeover! We finished the patio makeover and it was so hot out, so we decided to hop in the pool to cool off and have some fun. The boys absolutely loved it! While the boys played, I sat at my bistro table and sipped a delicious lemonade drink I created (I may have to share this recipe…it was a hit). Fancy snacks and fresh raspberries with lemonade drink for all was a must. We bought some macarons just for this special occasion! When the sun went down, we turned on our Jasco Landscape Lights to set the mood, lit a fire in the chiminea, and roasted s’mores together! What are some ways you will add whimsy to your patio? What activities will you enjoy on it? decorating, DIY, garden, home, Jasco, outdoor, patio, whimsical. Bookmark.